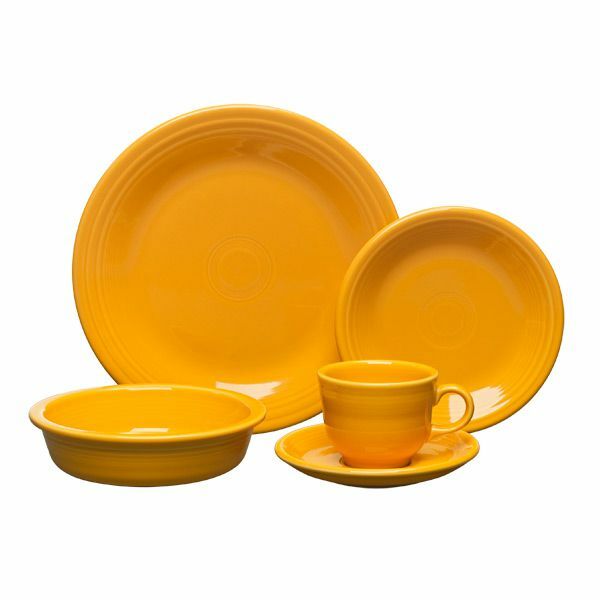 Here at the Silver Superstore, we carry every item in the Fiesta Marigold dinnerware line! The Fiesta dinnerware line allows you be be creative and show off a little of your personality. Go on, be bold; mix and match colors from the entire Fiesta dinnerware line. We recommend mixing Fiesta Marigold with Fiesta Lemongrass, Fiesta Plum, and Fiesta Sunflower. Fiesta Marigold dinnerware’s styling complements a wide range of decors. The large array of items in the line provide maximum service options and ensure consistent tabletop styling. The plate’s coupe shape allows maximum food plating surface; sculpted concentric rings highlight and frame the food presentation. Alpha Alumina added to the body enhances durability and provides superior heat retention. The Marigold color has been retired from the Fiesta line. We have no stock remaining.